Again, my thanks to Yvette for sharing these. 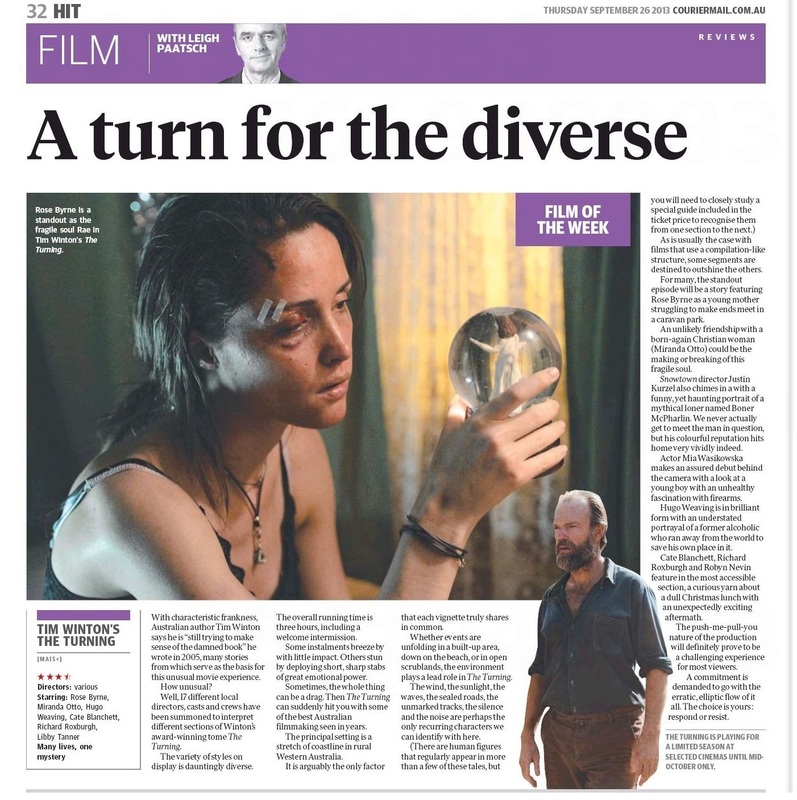 Inside Film and The Sydney Morning Herald (2nd SMH story on ticket sales here) have reported that the “special release” strategy has reaped huge rewards for the film, with many showings sold out and the film garnering positive buzz and likely AACTA nods. You can read production notes for the film at Femail.com. The film continues to receive mostly positive reviews, and I haven’t read any that were wholly negative; some critics preferred some segments to others (which is natural), and some disliked the central concept of separating the stories by cast and director instead of a more uniform approach, which they felt made the film more confusing or diffuse than the novel. I’m less sympathetic to complaints that the film lacked a unifying “message” or that it was too long. I’ll post a sampling of recent review quotes under a cut, followed by additional review links. This cinema experience is unlike anything I have ever seen before. It is screening for two weeks only at selected cinemas across Australia. The whopping 180 minutes of screen time has a scheduled intermission, necessary so the audience can come up for air – it’s intense…. One Short Story = One Short Film seems like a simple formula, but the demands of adaption are more complex. Clear narratives and concrete dramatic situations are usually an important component in satisfying movies (even David Lynch movies), but they are not always ingredients in successful short stories, which might take the form of artfully brief studies of character, or place, or history…Some short works, also, are so elegantly compressed that they truly do require a feature length running time to unpack….Not having read Winton’s book, the pieces in The Turning that lost me were those that preoccupied themselves in trying to untangle the delicate, internal emotional and psychological states that can be confidently expressed in prose, but tricky to externalize on film…. The bulk of promo material for Ivan Sen’s film is probably gong to appear in coming weeks, as the film’s general release (in Australia) in October 17. As I’ve noted before, there will also be festival screenings in London (LFF), Korea (Busan), Austin, Texas and Toronto (ImagiNATIVE Festival). 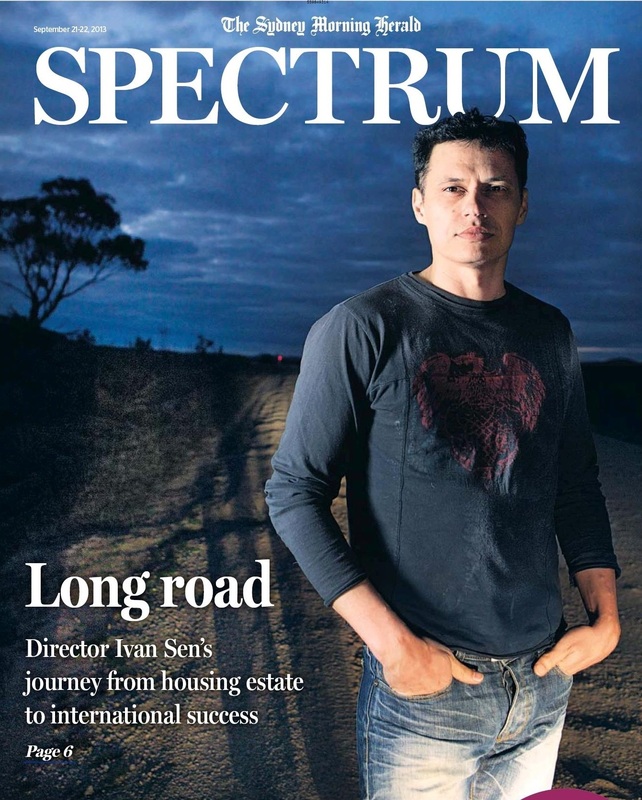 There’s a new profile of Ivan Sen in The Sydney Morning Herald, and a video interview of Sen, Aaron Pedersen and Ryan Kwanten (from TIFF) on YouTube. 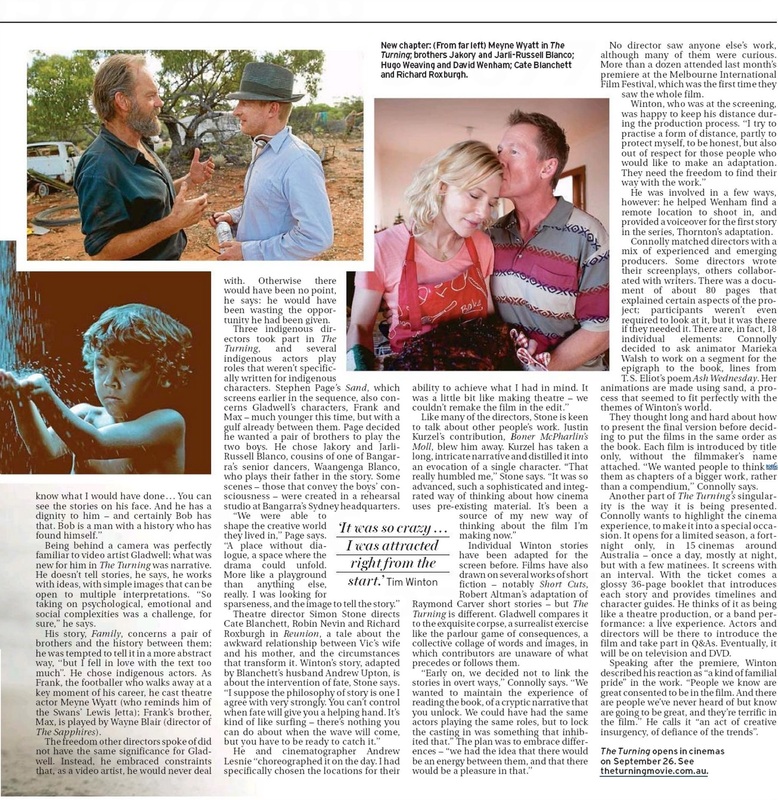 The Sydney Morning Herald also lists Mystery Road among its Most Anticipated Films for October. As Tim Winton’s The Turning approaches its September 26 general opening, promotional material and reviews have been published/posted frequently this week; I’ll begin by adding everything that’s appeared since the previous entry. Fans will probably be most interested in these new video interviews featuring Hugo; the first is a re-edited version of the Network Ten clip shared in the last entry, with some new material and exclusions. 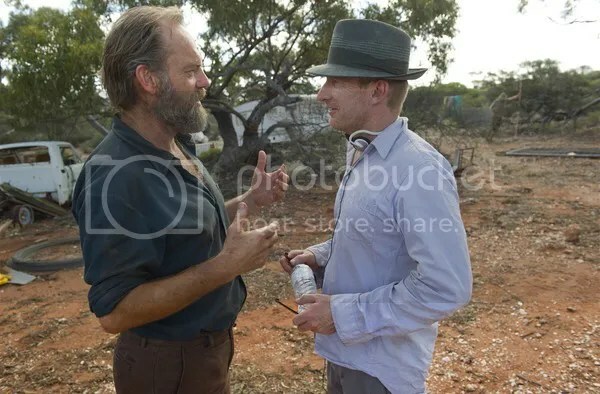 Since both are interesting, I’ll include the first one again; both feature Hugo Weaving, Mia Wasikowska and Robert Connolly being interviewed by Network Ten’s Angela Bishop. Unfortunately, the next video suffers from the sort of morning chat show shallowness that now seems a worldwide malady: the show’s producer’s feel a need to blast loud, unrelated music over the interviews (which really rankles when a subject is as soft-spoken as Hugo), focus on the subjects’ big Hollywood projects, no matter how unrelated to the film at hand, and in general exude a glib, clueless attitude. I include it for the sake of completeness, and because Hugo, as always, has interesting things to say (that Mia Waskowska is a “knock-out” isn’t really one of them, though he’s probably referring to her talent rather than her looks.) I was heartened that so many Australians mocked the tone of the interview… US morning shows have “pioneered” these annoying traits. It’s a shame that Aussie shows seem to be following their template. I also apologise for a few technical glitches in the presentation… I have the world’s clumsiest recording software. 😉 But I’m tired of LJ telling me I can’t direct-embed anything that isn’t YouTube. Rob Connolly, who produced The Turning and conceived its unique structure (and directed the segment “Aquifer”) has done the lion’s share of promotion, sitting for lengthy in-depth radio interviews with two ABC Radio programs: Books and Arts Daily and Conversations with Richard Fidler Both can be streamed or downloaded and last about an hour; if you’re interested in The Turning, Connolly’s other films (including Balibo, The Bank and Three Dollars) or the Australian film industry in general, they’re well worth the time. Connolly was also interviewed in this video feature on ABC Arts (another one LJ won’t let me embed) which features behind the scenes footage and scenes from the film. “When I read the story and then I subsequently wrote the screenplay, which basically was me taking the best of Tim’s Dialogue and taking it on myself, but when I read it, I couldn’t get the image of Hugo out of my mind for that particular character. 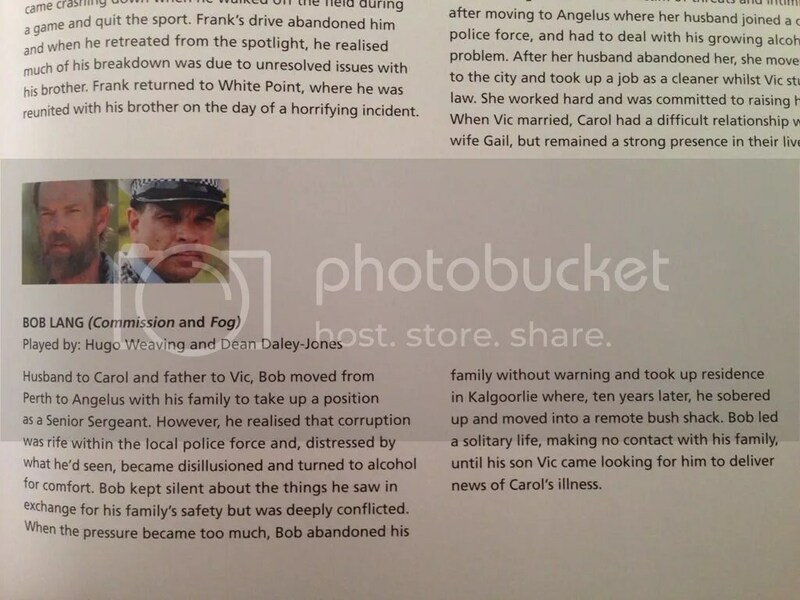 I just saw Hugo as Bob when I was reading it. So I was very concerned what I’d do if Hugo actually said no. You know, was it going to be a lay down misere? But thankfully Hugo said yes. Hugo is a huge fan of Tim’s work and it actually reminded me about 20 years ago Hugo and I worked together on a stage adaptation of another Winton piece, That Eye the Sky. So there was some sort of, I suppose, nice synchronicity in us working together again on another Winton piece. And I’ll repeat that Films Madman has compiled all of their official behind the scenes interview/promo featurettes and film clips (including a brief scene from “Commission”) on YouTube, and that ABC’s The Final Cut has a fine audio interview featuring interviews with Hugo Weaving and Rob Connolly if you missed it. You can read new reviews of The Turning at Impulse Gamer, Film Ink (1), The Sydney Morning Herald, Popcorn Taxi, Cinema Australia (they also have a lengthy interview with Rob Connolly), Graffiti With Punctuation, Switch, ArtsHub, Urban Cinefile, Cinemazzi, Concrete Playground, Film Ink (2), The Marshalltown and The Movie Review. Most of the reviews have been overwhelmingly positive, with the caveat that each viewer will prefer some segments to others (though there’s no clear consensus on which segments are the lesser one; “Commission”, “The Turning” and “Long Clear View” have been on many favorites lists.) The Australian and Sydney Morning Herald decided to pull their usual Tall Poppy routine (is dissing the film BECAUSE it’s ambitious and has intimations of profundity). Granted, I can lash out at movies which seem full of themselves and pompous with unearned notions or grandeur (ask me about Terrence Malik sometime…) 😉 but I don’t get that vibe from The Turning, and the book certainly wasn’t pretending to say anything too general or pretentious about The Australian Character. Some reviewers have said they think the film might work better as unrelated short films seen individually, but is overwhelming as a whole. That’s an intriguing idea, but I don’t think being overwhelmed (as opposed to bogged down) is necessarily a bad thing, and I think the film should be seen as designed, in a theatre if possible, before one breaks it down or revisits just “the good bits” via home viewing. Of course, the film experience is certain to be different for every viewer, and to engage (or fail or) in different ways based on one’s tastes and experiences. 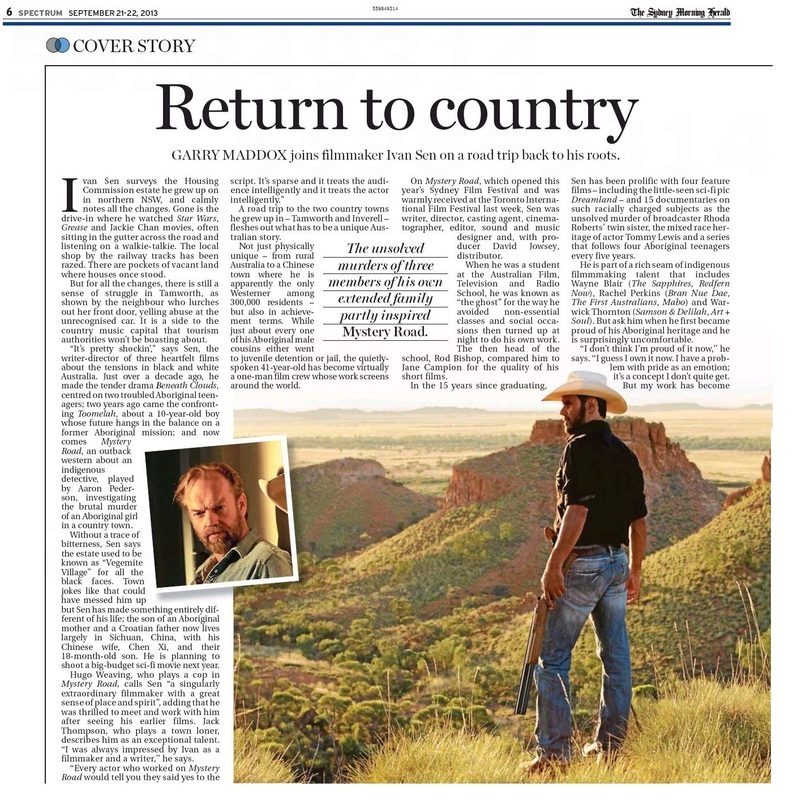 I’ll add the week’s print article scans beneath a cut: the first two are about The Turning (from The Gold Coast Bulletin and the Herald Sun), and last about Mystery Road (a cover profile of Ivan Sen from the Sydney Morning Herald Spectrum). 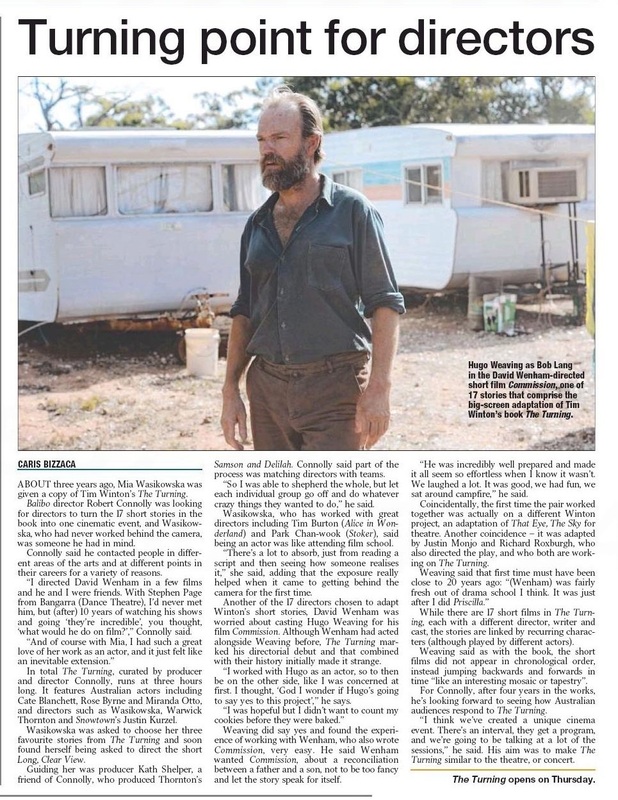 (I’m trying to avoid too many cuts here…) And I do realize that the two Turning pieces include duplicate content (interviews with Hugo Weaving and David Wenham, which originally appeared online at AAP/Local Today.) I’m erring on the side of completeness. Plus there are two different Hugo pics. 😉 And there’s a bonus in the form of an ad for STC’s Macbeth that was included in the Spectrum issue. 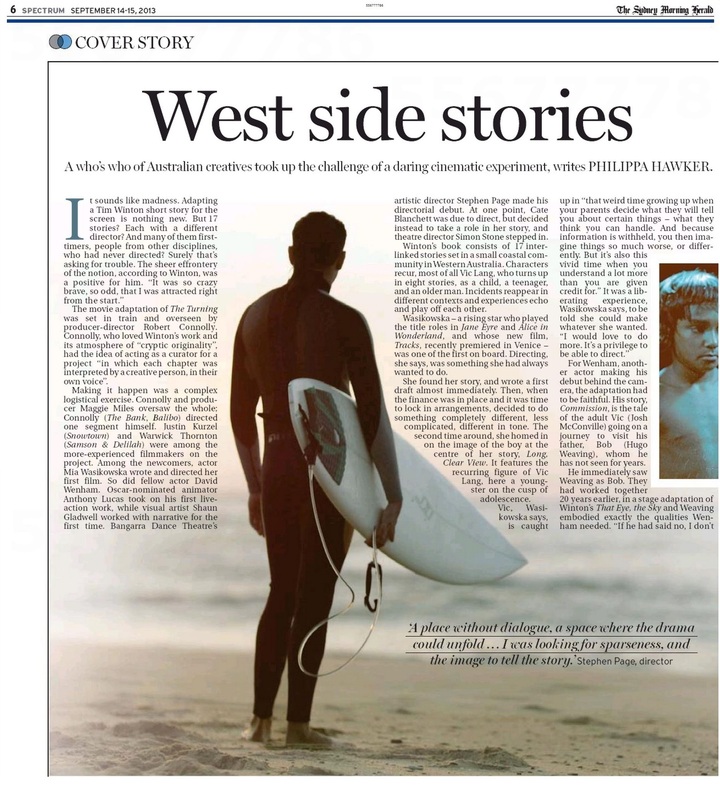 You can read the online version of the Ivan Sen profile above, and view a related video interview/travelogue, at The Age. 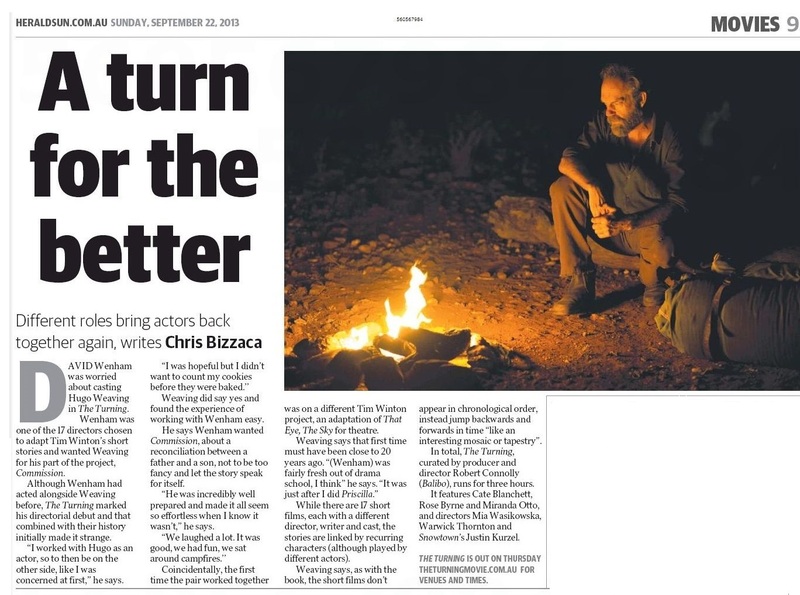 The Australian also published an in-depth interview with Ivan Sen which touches on the tragic autobiographical incidents which inspired the film. Unfortunately, a lot of the early London reviews of the film have been pissy and condescending, slighting the film for either not being a tidy, cosy procedural with a neat ending, or because it dared to have a black comedy element (yes, that’s intentional, as the marketing makes obvious) rather than becoming purely a polemic about the mistreatment of indigenous people. Subtlety hasn’t been much in evidence in most of the recent British mystery films and series I’ve seen lately, which favor grand guignol violence and whiplash-inducing plot twists (ie they’re too much like American mysteries for my tastes.) 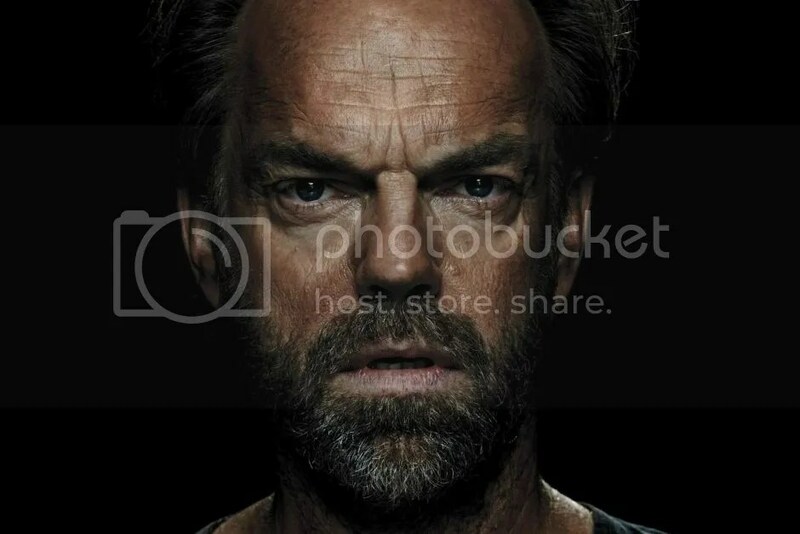 😉 I can’t be certain until I’ve seen the film (and my readers know I DON’T automatically approve of every film Hugo Weaving makes– not by a long shot) but some of these critics/filmgoers seem jaded, and seem unable to accept the film on its own terms. The fact that the film has been warmly received elsewhere reinforces this. 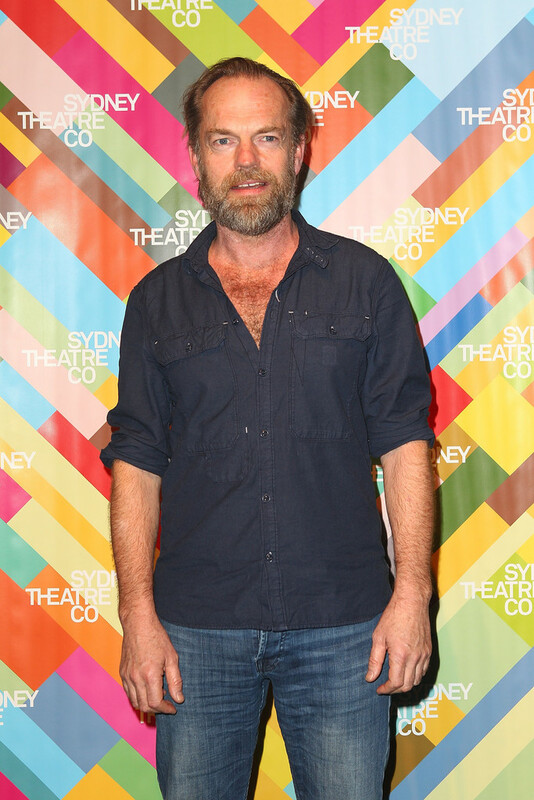 STC’s summer 2014 production, featuring Hugo Weaving in the title role and a unique inversion of the theatre space, continues to gather a lot of eager buzz; the play was included among Sydney Morning Herald’s most anticipated productions of the new season. And you can view a high-res image of Hugo by Michele Aboud’s stunning image of Hugo in the promotional art here. Promotion for the special Australian engagement of Tim Winton’s The Turning continues as the September 26 opening date approaches. Two new video clips went live today: the first, which was featured on Australia’s Network Ten late news, includes interview footage of Hugo Weaving discussing his work on the short “Commission”, and Mia Wasikowska (with producer Robert Connolly) describing her directorial debut on “Long Clear View”. The second is a brief clip from “Commission” (directed by David Wenham) featuring Hugo and Josh McConville (who plays his son) chatting beside a campfire about Bob Lang (Hugo’s character’s) decision to leave home. This scene and a scene from “Long Clear View” are also featured alongside Margaret and David’s reviews of the film at ABC’s At The Movies, in a clip compendium which also includes the film’s trailer. And Films Madman (the Australian distributor of The Turning and many other great films) has compiled all of the promo featurettes released thusfar for the film, and five films clips, including this one from “Commission” and a scene from “Reunion”, starring Cate Blanchett and Richard Roxburgh, on their YouTube feed. Hugo and David Wenham also spoke about “Commission” with Local Today; since it’s a relatively short piece I’ll include it under a cut here; alas, there were no accompanying photos. But both actors have intriguing comments about their working process, and about meeting on a different Tim Winton project (That Eye, The Sky) 20 years ago. 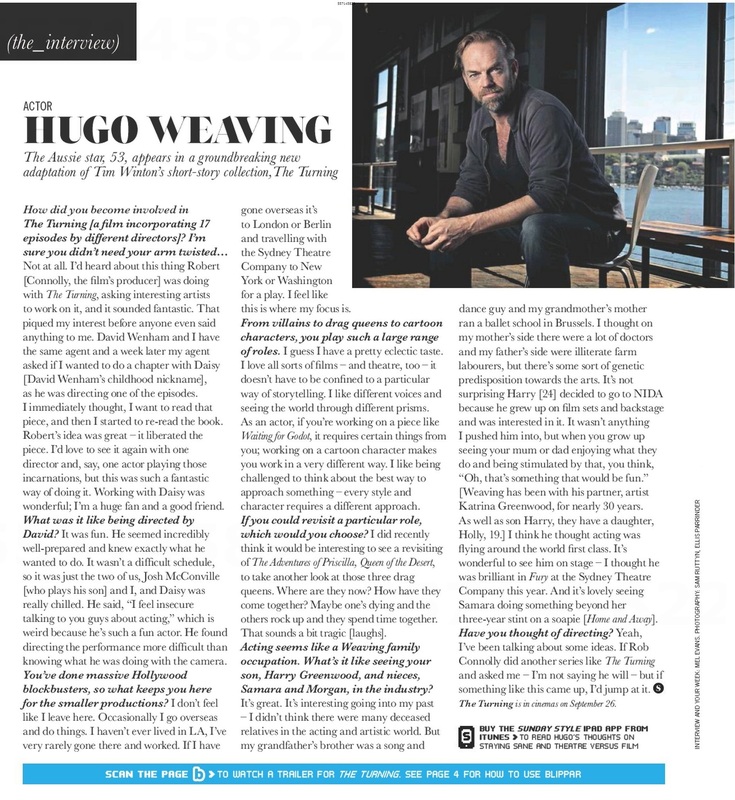 I’ll also include the complete iPad version of the Sunday Style Hugo Weaving interview which I included in the previous entry…The first part and photo are identical to the print version, but this has four extra questions and answers at the end. My thanks to Elisa at Random Scribblings for the technology assist; neither of us thinks content should be available only to wealthy fans with specific-brand technology. Wenham was one of the 17 directors chosen to adapt Tim Winton’s book of short stories and wanted Weaving for his film Commission. Although Wenham had acted alongside Weaving before, The Turning marked his directorial debut and that combined with their history initially made it strange. “I worked with Hugo as an actor, so to then be on the other side, like I was concerned at first. I thought, `God I wonder if Hugo’s going to say yes to this project’,” he says. Weaving did say yes and found the experience of working with Wenham, who also wrote Commission, very easy. He says Wenham wanted Commission, about a reconciliation between a father and a son, not to be too fancy and let the story speak for itself. “He was incredibly well prepared and made it all seem so effortless when I know it wasn’t,” he says. Coincidentally, the first time the pair worked together was actually on a different Tim Winton project, an adaptation of That Eye, The Sky for theatre. 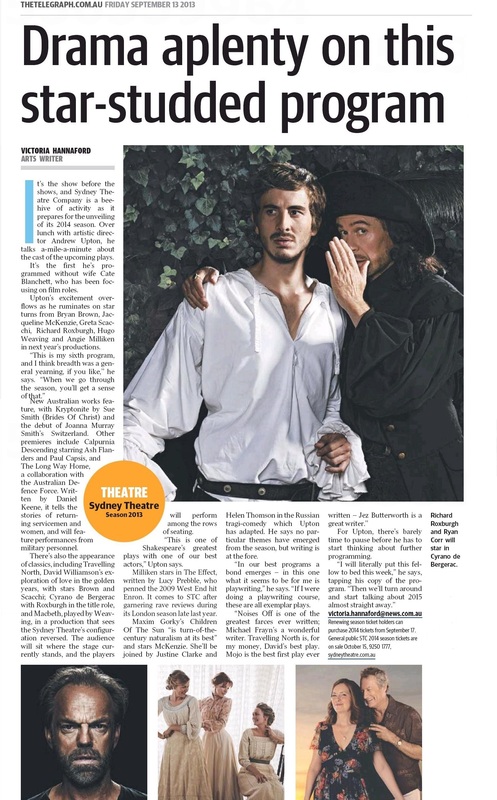 Another coincidence – it was adapted by Justin Monjo and Richard Roxburgh, who also directed the play, and who both are working on The Turning. Weaving says that first time must have been close to 20 years ago. “(Wenham) was fairly fresh out of drama school I think. It was just after I did Priscilla,” he says. Wenham was one of the key reasons for Weaving signing onto The Turning. But the unusual aspect of the project was also appealing. While there are 17 short films, each with a different director, writer and cast, the stories are linked by recurring characters (although played by different actors). Weaving says as with the book, the short films don’t appear in chronological order, instead jumping backwards and forwards in time “like an interesting mosaic or tapestry”. In total The Turning, which was curated by producer and director Robert Connolly (Balibo), runs at three hours long. It features Australian actors including Cate Blanchett, Rose Byrne and Miranda Otto, and directors such as Mia Wasikowska, Warwick Thornton and Snowtown’s Justin Kurzel. Weaving says people who love the book, will love the film. “You get a very strong sense of Tim having seen the whole piece,” he says. Robert Connolly gave an extended interview to the Talk Hard podcast at Quickflix, and discussed “Commission” in addition to the rest of the film; you can stream the interview online or download the full podcast via iTunes. No iPad required this time. 😉 There is a new gallery of stills from The Turning at the film’s Facebook page (the two featuring Hugo have been widely posted online) and there are glowing review at AltMedia.net, ABC and Brag Magazine, in addition to the At The Movies link mentioned earlier in the post. 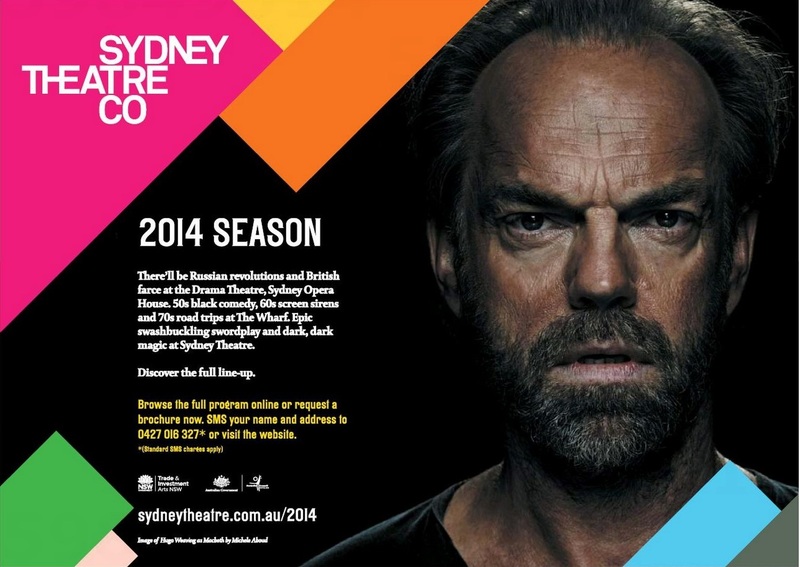 Anyhow, new articles about Macbeth and STC’s 2014 season can be read at The Sydney Morning Herald and Aussie Theatre. In addition to screenings at the Darwin International Film Festival (18 September), Busan (October 6 (2 showings), 9 and 10 (two showings)) and London Film Festival (October 10, 11 and 19), Mystery Road has been booked for a Marquee Screening at the Austin Film Festival, which runs October 24-31. (Specific dates and times TBA). Alas, I have commitments that week which would preclude the travel required to attend, and will have to keep hoping for east-coast US screenings. But I do think Mystery Road is a perfect fit for Austin. Note: The Darwin Deckchair Cinema schedule also includes Tim Winton’s The Turning, so Hugo fans in Northern Australia will definitely want to look into attending. You can read the latest reviews of Mystery Road at Cinemablographer, Scene Creek and Exclaim.ca. I think some of these comparisons to the doom-laden ouvre of Cormac McCarthy and to tidy, genre-bound Westerns alike a somewhat misguided, for the record. 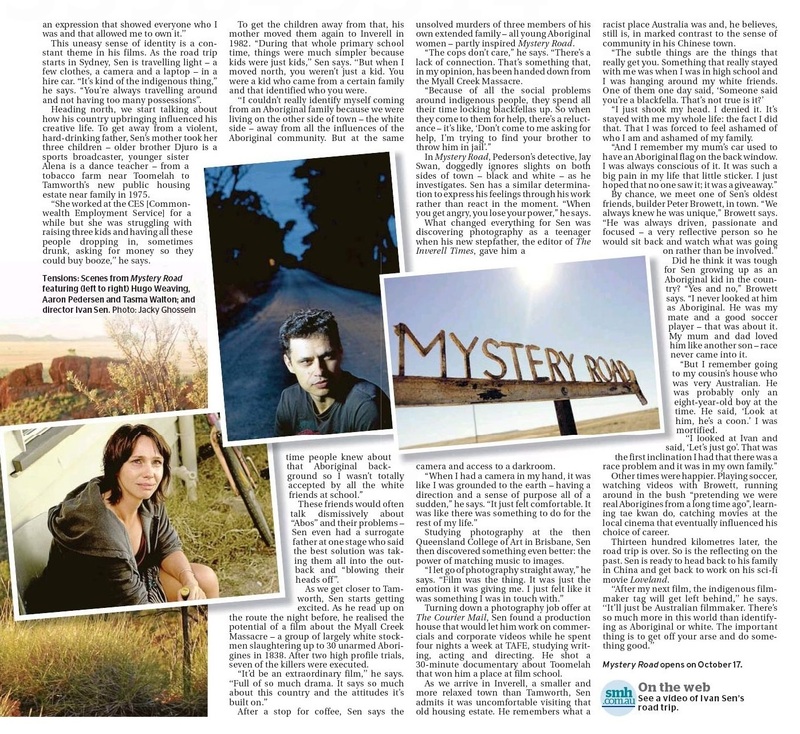 Ivan Sen has repeatedly noted that presenting a neatly packaged murder mystery where all questions are answered and motives and actions thoroughly explored for the viewer was never his intention. Of course, viewers will have to decide for themselves whether or not the film works for them. 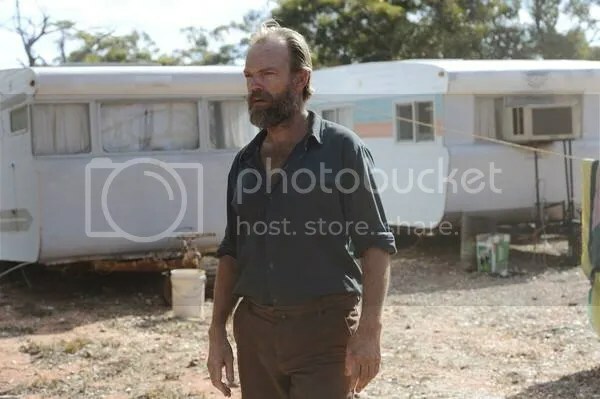 Another new video featurette for Tim Winton’s The Turning featuring a Hugo Weaving interview has been posted online, this time at AAP. Like the Ten News video, this features film footage and comments from Hugo, producer Robert Connolly and director Mia Wasikowska, but a different interviewer and questions. Hugo’s bit starts about 3 minutes in. Also: ABC has a different featurette with a Rob Connolly interview about how the project came together (Wasikowska and Cate Blanchett also comment briefly.) And the latest positive review can be read at Salty Popcorn. Strangely, no images from the Sydney premiere of The Turning seem to have been posted online, suggesting perhaps that there wasn't a large press presence at the event. 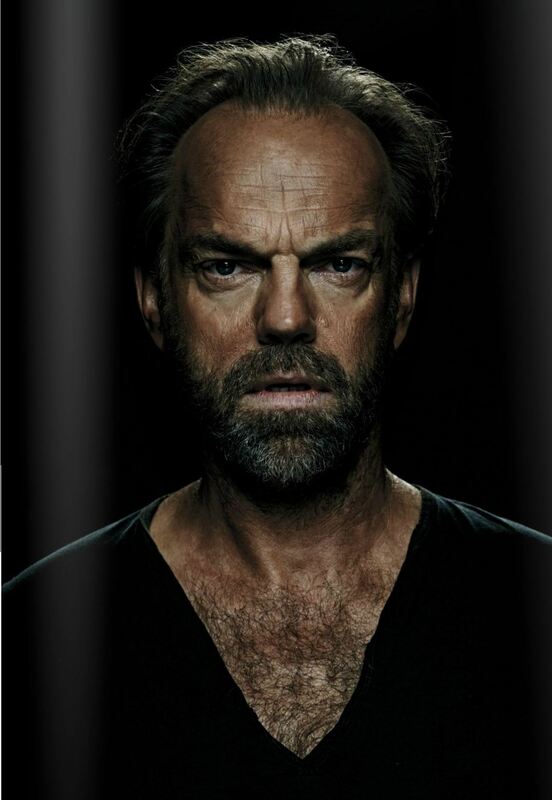 But coverage of The Turning, and of Sydney Theatre Company's fantastic 2014 season plans have exploded; seems a lot of people worldwide really want to see Hugo Weaving play Macbeth. This might be a cue for STC to finally take up the notion of filming or simulcasting productions. Yes, touring should also be an option (even for productions that don't feature Cate Blanchett) 😉 but the uniqueness of STC's production, including an inverted theatrical staging, might be lost in other venues. Filming/simulcasting would give fans worldwide the opportunity to share in the experience and would give all of those curious about STC's theaters who can't always afford Australian vacations the opportunity to see what Australian fans have been raving about for so many years. The Royal Shakespeare Company, National Theatre and New York's Metropolitan Opera broaden their audiences and bring in added revenue through global simulcasting. I know it's not the same as seeing the plays in person, and I want to see Hugo play Macbeth perhaps more than I've wanted to see any other play in my life… but not every production can tour, and those that do can't reach all the fans who want to see them. So again I'll beg the STC… please film and simulcast this. And I'll keep going to see any productions you bring to the US. If you'd like slightly larger versions of the threeGetty/Zimbio photos I posted in the previous entry (or high-res pics of Cate Blanchett at the same event) you can find them at Just Jared. 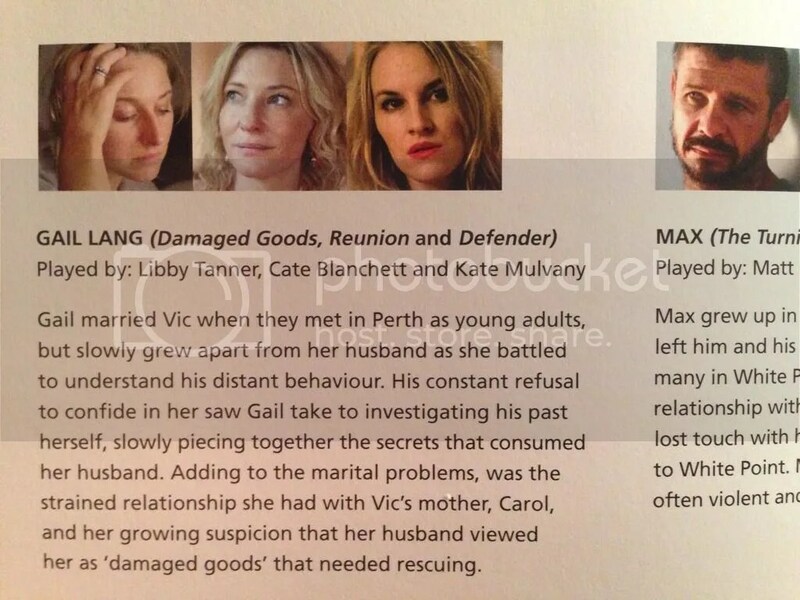 As amazing as all the Macbeth news has been recently, there's been even more on Tim Winton's The Turning, despite the lack of premiere night pics. (To be fair, the film's world premiere at the Melbourne International Film Fest was lavishly covered at the time.) Hugo and several of the film's directors have been taking on a lot of the promotional duties for the film. Hugo and producer Robert Connolly sat for audio interviews with ABC Radio on the program Final Cut; you can stream or download the audio here. There's also a complimentary review of the film (and some audio of Hugo's role). In addition to The Turning, Hugo discusses his widely variant career, why he seeks out challenge and why he favors independent Australian productions above all. Hugo also gave an interview to Sunday Telegraph's Sunday Style magazine which covered even broader territory, including his family's performing arts tradition, the possibilities of directing just as his pal David Wenham has, and why he'd choose Tick in Priscilla as the role he'd most like to revisit. (Something I mused about here not too long go, amusingly. Though I suggested the three reunite over the passing of Bob, Bernadette's companion, which would allow for a nice tribute to the late Bill Hunter.) Though Hugo has done new photo sessions recently, they opted to use a 2010 pic (a very nice one, granted) taken at STC's Wharf Theatre to accompany the piece. 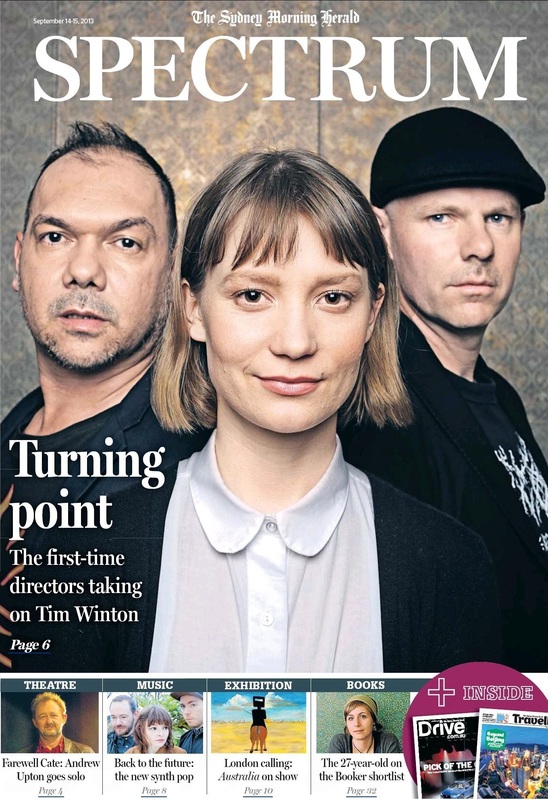 That's right below the cut, as is Sydney Morning Herald Spectrum's cover piece on The Turning, which features a David Wenham interview and a great new pic of Hugo and David on the set. 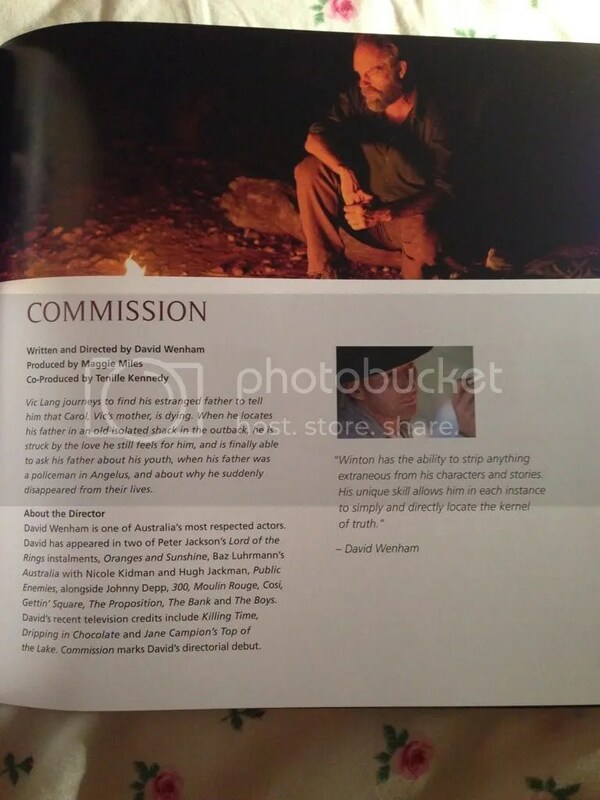 So we might see Hugo Weaving direct David Weham in a compendium piece at some point. I'm certainly up for that, and it's always great to have assistance from Wenham's fan community in finding material. 😉 The digital version of the Spectrum preview is available at WA Today (without as many pictures), but so far the Sunday Style has only appeared in print editions. So we still don't know who Hugo did the AAP photo session for… meaning there's likely more to come as the film's release date approaches. Note: if anyone has the iPad app noted at the end of the Sunday Style which unlocks exclusive interview content, please let me know. I don't have the budget to join The Apple Cult, and am always infuriated when content is made exclusive to the select few like this. If I buy a newspaper, I shouldn't have to pay additional fees or have expensive technology to read a complete piece. Not as much new news on this film, as Hugo's been busy on other projects, but Ivan Sen's TIFF interview has been posted online by the Toronto Star/Red Carpet Diaries. All three TIFF screenings of Mystery Road sold out and there's (yet unconfirmed) buzz that the film will play a few US festivals after its visits to Busan and the London Film Festival. I'll share any news that becomes official. 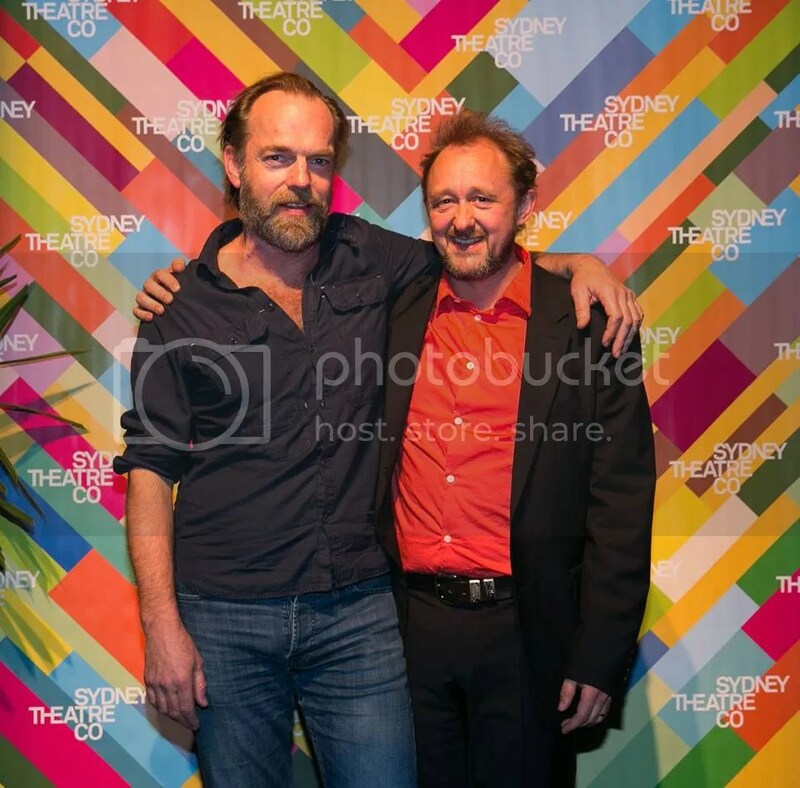 Andrew Upton, STC’s Artistic Director, gave ABC Online an interview about the new season, and said this of Hugo’s participation: “Every year I talked to Hugo about what he’s up for doing, what interests him and that kind of led to Macbeth…I think it will be a beautiful thing to see him playing that role, and it’s a great time in his career to be grappling with that role.” STC will also experiment with the staging of the piece, in effect having the audience and actors switch places: ““…so the audience will be sitting on the stage, looking back into the auditorium where the action will play out. 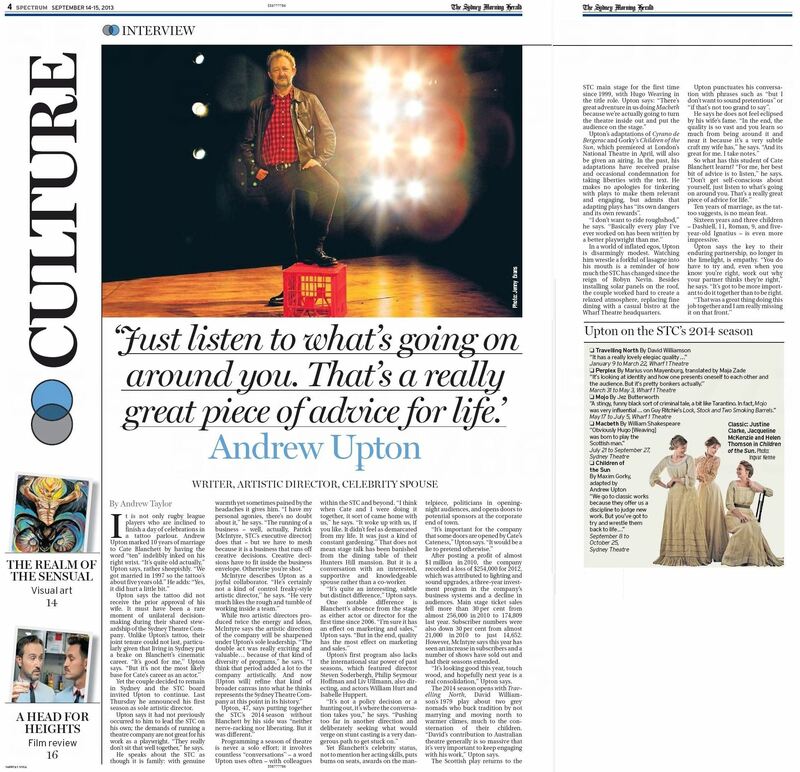 ‘I really am interested in any audience having a new experience of a theatre like that,” Upton said. 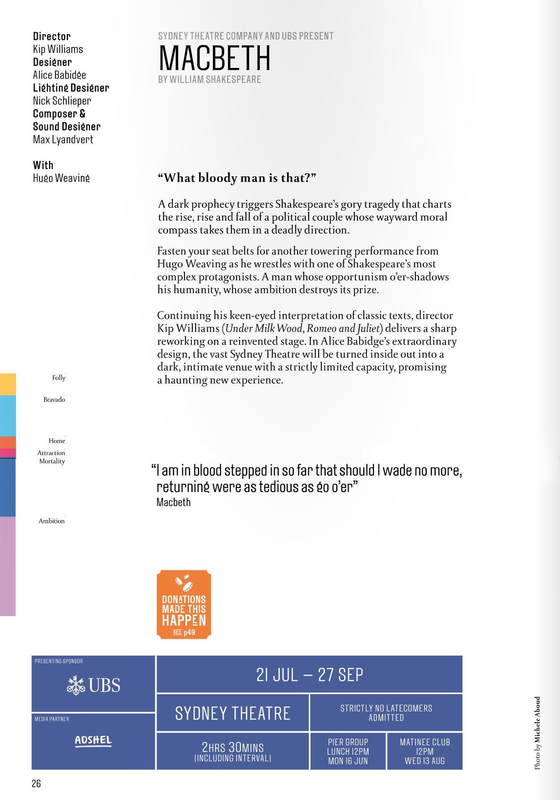 ‘It is quite a defined space, so the opportunity to turn that around and turn it on its ear is a great opportunity for our loyal audiences who know the space well and will now see it completely differently, but it’s also just a great opportunity for the theatre.’ ” There’s also a summary of STC’s 2014 season in The Daily Telegraph. Cathy, Creative Drinks: “The Turning mixed great established actors like Cate Blanchett, Rose Byrne and Hugo Weaving with yet unheard of up-and-coming actors… The acting in each story was excellent and did a great job of transporting you from your cinema seat into the various worlds presented in The Turning…. In addition to prominent showcases at the London Film Festival and Busan Film Festival next month, Mystery Road will be the opening night presentation at the ImagiNATIVE Film and Media Arts festival in Toronto on October 16, showing in the same theatre where it premiered last week at TIFF. More details at Broadway World Movies. The Turning and Mystery Road are also both eligible for Best Picture at next year’s AACTA Awards, two of fifteen films from which five eventual nominees will be chosen this fall. BREAKING NEWS: We’ve got pics of the STC’s 2014 Season Launch! 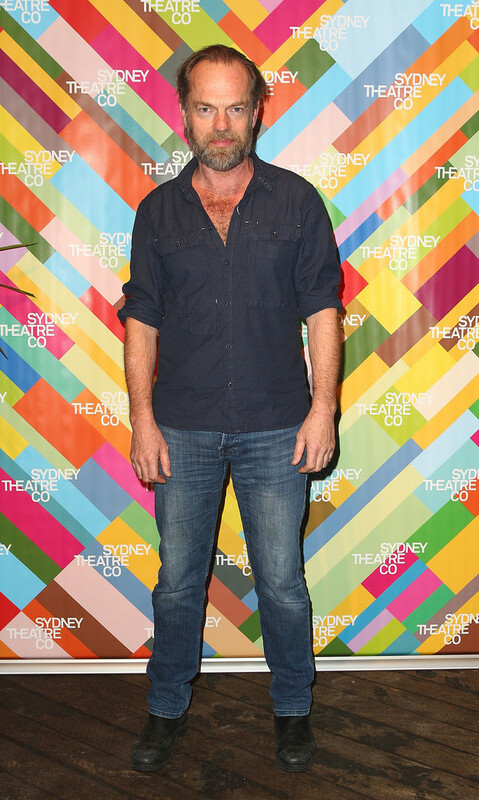 “Kip Williams takes a giant step up from Under Milk Wood and Romeo and Juliet, to take on not only Shakespeare, and not only with Hugo Weaving in the lead, but in the Sydney Theatre. This bold production will seat 300-or-so audience members on risers on the stage, and the actors in the auditorium. 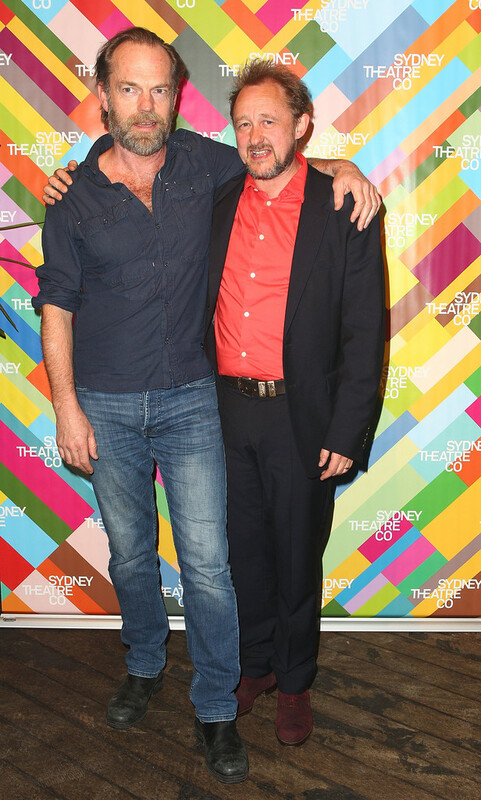 Williams had the idea during a stint as assistant director to Andrew Upton on The White Guard, and the two took the conversation up again earlier this year, re-visiting the theatre. Nick Schlieper and Alice Babidge (behind the visually ravishing staging of The Maids) will be upping the creepiness factor with lighting and set design, respectively. Macbeth is Upton’s favourite Shakespeare – “for the rather banal reason that I studied in the most depth, because it was an HSC text,” he laughs.